I went ahead and got all of the block units sorted into groups of four that will be sewn into the final blocks. Trying to pull from the seven different block piles randomly would probably just end in disaster. 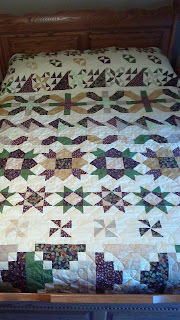 Hopefully I have mixed up the different units enough so that there aren't too many obvious repeats within the quilt! I also decided to sew together the blocks differently than in the original pattern -- the original pattern has you sew your four units together with the small points in the middle rather than your "burst" in the middle. 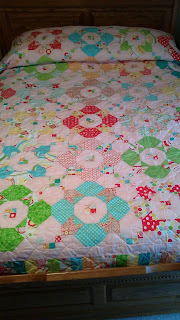 This way, I'll have less pinning and easing to do when I sew my blocks into rows. It will also hopefully make it easier to arrange blocks since none of the colored fabrics will be touching each other. One block down, 24 to go! Sharing at Fabric Tuesday, Sew Cute Tuesday, Oh Scrap! and Let's Bee Social! HBD Designs: Made by YOU! 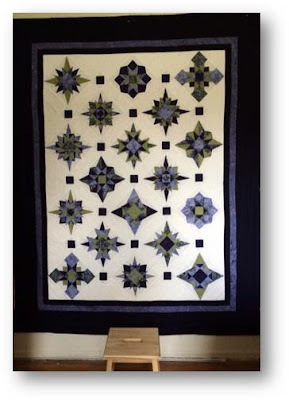 One of the most exciting things about being a pattern designer is seeing people make quilts from your designs! Today I wanted to share a few quilts made by you inspired by our patterns! 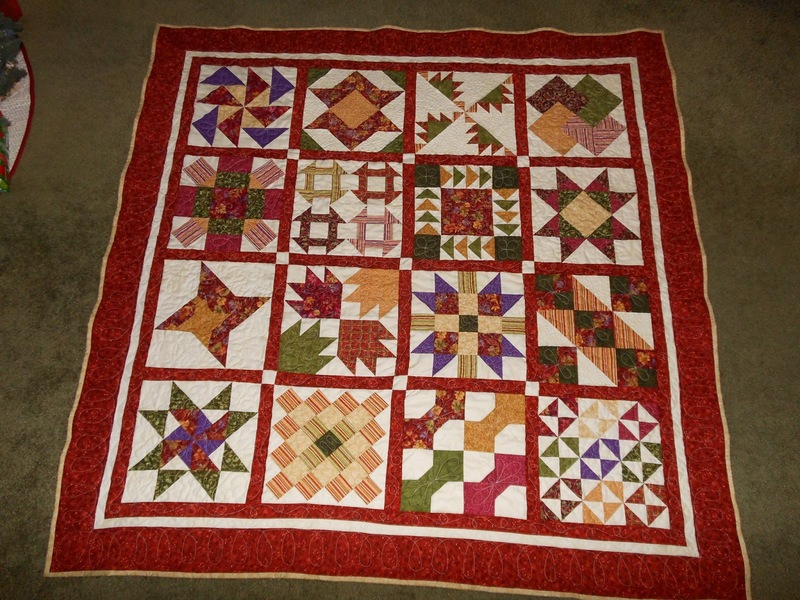 First, we have Debra's Starburst Quilt. 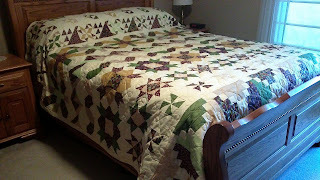 She participated in our original quilt along and here is her finished quilt! Next we have Jordan's version of Square Pegs. She made an ombre effect quilt! And finally her Spring Splendor quilt -- with a candy pink background! If you've made a version of one of our patterns, please share it! 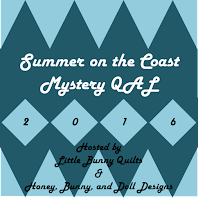 You can email us pictures at honeybunnyanddoll@gmail.com or littlebunnyquilts@gmail.com! While a lot of my time has been recently devoted to my upcoming Moda Bake Shop quilt that I can't show you just yet, I have been working on not one, but two stash/scrap buster quilts using the Firecracker pattern from Fat Quarter Shop. 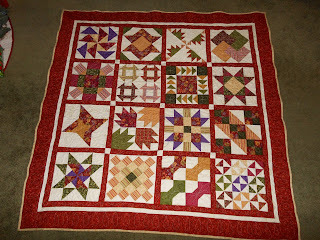 I made a quilt with this pattern last fall for the blog hop, but I thought this would be a good pattern to use up the very large stash of 2.5 inch strips that I have collected over the years. Instead of using 5 strips per set as in the pattern, I decided to go with 4 strips per set. 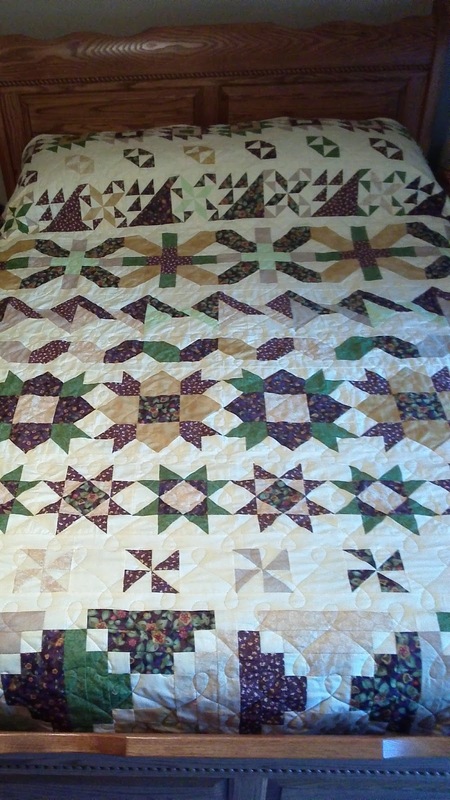 When I made my original quilt, some of the trimmed blocks ended up with little to none of the fifth strip showing at all, so I decided that I would go ahead and make my blocks all slightly smaller. 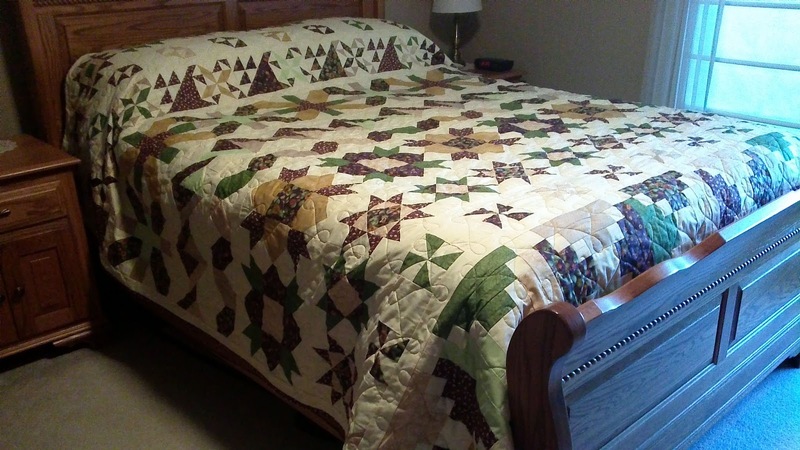 I was able to cut 15 units out of each strip set so I had to add a half of an extra strip set in addition to the six sets shown above to reach the 100 wedges that I need for the quilt. For both quilts I started with a "focal" fabric that I had four or so strips of, and then pulled additional fabrics to coordinate. I started with a yellow background floral print and pulled reds, grass greens, true blues, and a few other yellows. This one I haven't started making any of the actual blocks yet. For the other quilt, I also started with a yellow background floral print, but pulled teals, pinks, olives, and oranges to match. This one I started making blocks and trimming them -- however I realized that I didn't have enough background fabric to finish all of the blocks a little too late in the process! I got about half way through and will be going to get some more of the correct white this weekend. Surprisingly, even using one less strip than the pattern, I only had to cut my squares a half of an inch smaller to accommodate for the change! Sharing at Building Blocks Tuesday and Let's Bee Social! It's time for me to show of my last three blocks for April's orange blocks in the Rainbow Scrap Challenge! These came together slightly faster than the previous weeks' blocks because there were fewer "parts" of the block to sew together to finish them. I think may favorite out of these three is the Garden Path block. While my orange scrap pile was not as large as some of the piles I started with in previous months, I still seemed to make a respectable dent in reducing the pile. I am just realizing now that I made three different basket blocks this month! It's hard to believe that it is April already and that we are a third of the way through the Stash Bee for the year! This month Tori requested Rainbow Star Patch Blocks -- where each person makes a block in a single color with a white star. I made this teal block and for some reason I had a really hard time finding groupings of fabric that would work for this block without using only two fabrics for the block! Hopefully my other hive mates will have better luck and Tori will end up with a beautiful rainbow of blocks! Sharing at Linky Tuesday and Fabric Tuesday! It's another Scrappy Saturday parade of Farmer's Wife blocks and April is our month for orange. This week I had one tedious block and three easy ones. The names for these ones aren't super creative, as you can see! I decided to use grey for the background of the Four Winds block because I needed a lot of it and didn't want to use up one of my peach fabrics too early in the month. I also really like the Friendship block because I was able to use the pansy fabric! Some of these blocks aren't suited to be used with larger scale prints so I really like it when there are a few blocks where I can fit one in. I'm very happy with my sprinkling of black accents thus far and have planned out my last three blocks for this month and will hopefully finish those tomorrow. Sharing at Scrap Happy Saturday and Sew Cute Tuesday! Another little finish is completed and sent off to its sweet little new owner! I finished up my little Bear Tracks quilt (with a few modifications from the original pattern) this weekend and am so happy with how stinking cute it is! 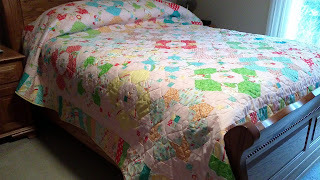 I quilted it with curly daisies to help break up the very angular blocks. I used pink snuggle flannel on the back, and bound it with some pink leaf print fabric from my stash. At 40 inches square, this is a perfect little snuggler for a little baby to cuddle in. I love being able to make something sweet for all of the babies my friends are having! It seems like I always have at least one in progress all the time! 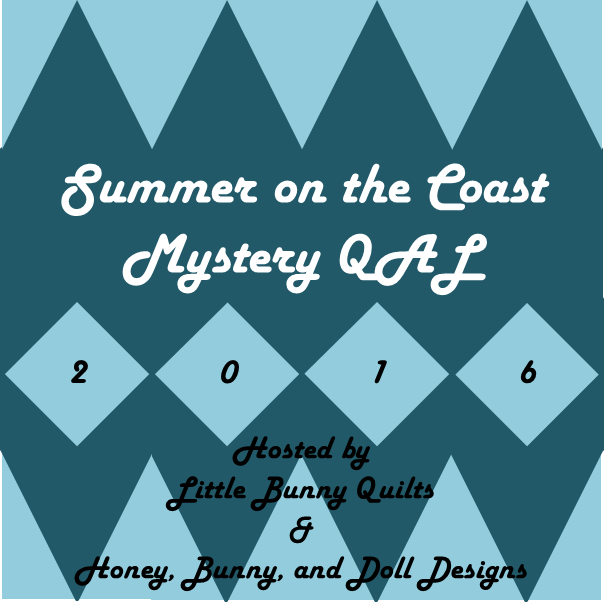 Welcome to our first real month of the Summer on the Coast QAL! This month we are starting off simple, so if you are a brand new paper piecer you can totally do this! If you are not interested in paper piecing your blocks, you can easily find tutorials for perfect SIAS units on the internet. You will need a 6.5 inch block unfinished (6 inches finished). As always, make sure that your paper piecing template prints out at the correct size -- from dotted edge to dotted edge, your block template should measure 6.5 inches! To start off, center your square within the template with sufficient overhang on all four sides. I found it helpful to pin the squares to the paper foundation for the first seam. Line up your first triangle along one of the sides of your square. Sew on the line, press and repeat with your second triangle. I found it easiest to sew the opposite triangle second. Repeat with your 3rd and 4th triangles. A quick tip: sometimes it is hard to "eyeball" lining up your triangle in the center of the square, but if you make sure that the overhang is equal distance on each side of your square piece, you will have perfectly aligned triangles every time! You can see in the diagram below that the unsewn triangle #3 has "dogears" that are the same size on each side of the block. After giving your block a final press, you are ready to trim on the dotted lines for your final unit. Notes on color selection: I choose my smallest fabric cut to use in all of the centers of my units. I picked a contrasting color for my corner triangles. I didn't use any "background" fabric in my units this month. If you have a larger scale print, you will likely want to use it as your center squares. 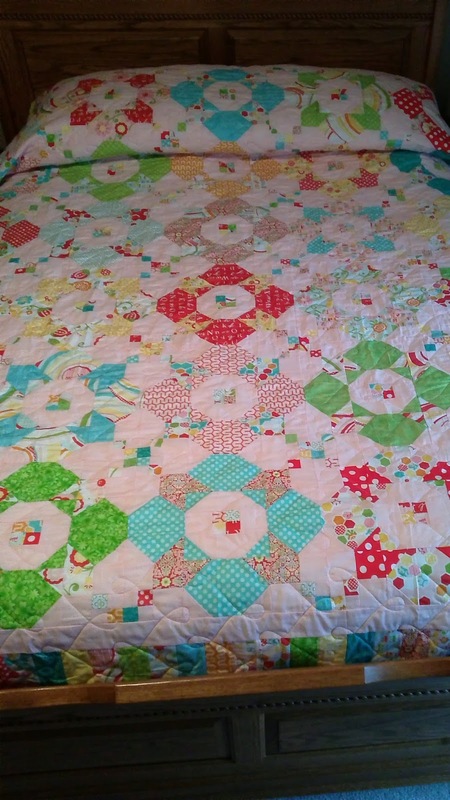 Share your finished blocks in the HBD Designs Flickr group! It seems like it is such a long wait between finishing my Rainbow Scrap Challenge blocks for one month and waiting for the color announcement for the next! I was very excited when orange was finally announced for April. I really like orange and think it is an under-appreciated color. However, I still found that I didn't have a very large pile of "true" oranges to work with and so I added in some peaches and corals into my fabric pulls. I am excited to continue making more orange blocks this month! Check out what everyone else is making at Scrap Happy Saturday! Also sharing at Building Blocks Tuesday!